Rwandans are mourning the deaths of 14 miners after a landslide Monday at a tin mining site in this hilly eastern area. The country's mining board said recent heavy rains had saturated the red earth, triggering the tragedy. Survivors said they saw the ground shifting but could not save their workmates. The earth suddenly swallowed up seven men and seven women. When he noticed cracks in the soil, John Ntanyungura set down his mining tools. "I managed to escape," he said, "but all my colleagues who were behind me perished." The miners were digging for cassiterite, a tin oxide mineral used in producing electronics such as mobile phones and digital cameras. 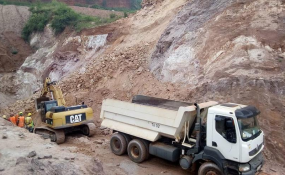 The Ntunga open mining site is owned by Rwanda-based Piran Resources Ltd., a subsidiary of the British-based mining exploration and development company Pella Resources Ltd. Piran has a 25-year lease to mine at two concessions in eastern Rwanda, Reuters news agency reported. Piran Resources has not commented on the accident. Francis Gatare, chief executive officer of the Rwanda Mines, Petroleum and Gas Board (RBM), said in a statement that the government has temporarily shuttered Piran's local operations during an investigation. He also said the accident surprised the board because Piran is considered among the country's good mining operators. Mbonyumuvunyi Rajab, mayor of Rwamagana district, said the whole country is mourning the Ntunga mine victims. He urged miners to be careful, and he pressed mining companies to respect the government regulations for mining safety. "We are telling our citizens to remain strong because losing such a large number of people in this unexpected circumstances is not easy to bear," Rajab said. "We are also reminding those diggers that they work in high-risk zones and they need to comply with safety conditions that are imposed on their companies. Sometimes, many of them enter holes without any protection, so they can easily die or meet with an accident," he said. Small-scale mining in Rwanda's hilly landscape has led to landslides and mine collapses. The Mining Board says 81 people died in 2018 in various mining accidents. Last October, eight people were killed and four wounded in a mine collapse in southern Rwanda's Muhanga district. Last month, at another mining site in the south, five miners were trapped underground when the site collapsed. Soldiers and members of the public dug them out alive after nearly two days. The government estimates that about 43,000 people are employed in the mining industry, Reuters said. Earnings from Rwanda's mineral exports more than doubled to $373 million in 2017, from $166 million a year before.